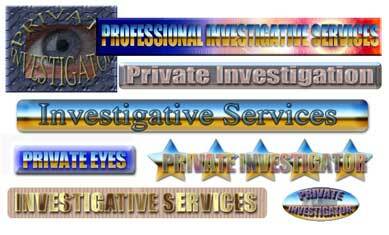 MAKE YOUR INVESTIGATIVE WEB SITE LOOK GREAT! If you do your own web site, this top quality CD of massive professional investigative web graphics designed by Ralph Thomas is just want you need to make your web site look very sharp and stand out from the crowd. These images are optimized for web sites and are fast loading. The PI Web Graphics CD is very easy to use! Just open in a web browser and pick the graphics you want for your web site. Very Sharp Tiled Backgrounds That Work! Other Aids And Resources To Make Your PI Web Site Hum! MAKE YOUR WEB SITE HUM! You will find hundreds of different and unique investigative related graphics on this special CD Collection you will want to explore to improve your web site. Royalty free graphics you can use again and again for your web site. All on one CD-Rom. A Single user disk gives you royalty free graphics for one web site. As an extra added bonus, you are given web access to millions of other web graphics, banners, animations, sounds and sharp java scripts you can use for your web site as well as a huge collection of other web site aids, tools and resources. A multi-user disk gives you the rights to use the graphics on multi-web sites.